This article is about the Dutch province. For other uses, see Limburg. Limburg (/ˈlɪmbɜːrɡ/, Dutch pronunciation: [ˈlɪmbʏrx] ( listen); Dutch and Limburgish: (Nederlands-)Limburg; French: Limbourg, French pronunciation: ​[lɛ̃buʁ]) is the southernmost of the 12 provinces of the Netherlands. It is in the southeastern part of the country, stretched out from the north, where it touches the province of Gelderland, to the south, where it internationally borders Belgium. Its northern part has the North Brabant province to its west. Its long eastern boundary is the international border with the German state of North Rhine-Westphalia. Much of the west border runs along the River Maas, bordering the Flemish province of Limburg, and a small part of the Walloon province of Liège. On the south end, it has borders with the Flemish exclave of Voeren and its surrounding part of Liège, Wallonia. The Vaalserberg is on the extreme south-eastern point, marking the tripoint of Netherlands, Germany and Belgium. 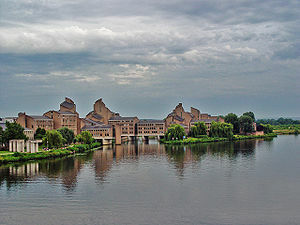 Limburg's major cities are the provincial capital Maastricht, as well as Heerlen, and Sittard-Geleen in the south, Venlo in the north and Roermond and Weert in the middle. More than half of the population, approximately 620,000 people, live in the south of Limburg, which corresponds to roughly one-third of the province's area proper. In South Limburg, most people live in the urban agglomerations of Maastricht, Parkstad and Sittard-Geleen. Limburg has a highly distinctive character. The social and economic trends that have affected the province in recent decades have generated a process of change and renewal which has enabled Limburg to transform its peripheral location into a highly globalized regional nexus, linking the Netherlands to the Ruhr metro area and the southern part of the Benelux region. A less appreciated consequence of this international gateway location is rising international crime, often drug-related, especially in the southernmost part of the province. Limburg's name derives from the fortified town of the same name, situated on the river Vesdre near the High Fens, now in the nearby Belgian province of Liège. Its name is derived from the Germanic elements *lindo, "lime tree," and burg, "fortification." Limburg town was the seat of the medieval Duchy of Limburg. None of present-day Limburg was part of this duchy, which had its northern border along what is the modern southern border of South Limburg. South Limburg in the Middle Ages was mainly made up of the lands of Valkenburg, Dalhem, and Herzogenrath, which under the rule of the Duchy of Brabant came to be known collectively as the Lands of Overmaas. The Duchy of Limburg and its dependencies first came under Brabantian control in 1288, as a result of the Battle of Worringen, then in the 15th century under the Duchy of Burgundy. By 1473, the Lands of Overmaas and the Duchy of Limburg formed one unified delegation to the States General of the Burgundian Netherlands. Both the terms Overmaas and Limburg came to be used loosely to refer to this sparsely populated province of the so-called Seventeen Provinces. Maastricht was never part of this polity; as a condominium souvereignty over this city was held jointly by the prince-bishops of Liège and the dukes of Brabant. Also, the central and northern part of present-day Limburg belonged to different political entities, notably the Duchy of Jülich and the Duchy of Guelders. After 1794, the French unified the region, along with Belgian Limburg, and removed all ties to the old feudal society (the ancien regime). The new name, as with all the names of the départements, was based on natural features, in this case Meuse-Inférieure or Neder-Maas ("Lower Meuse"). After the defeat of Napoleon the newly-created United Kingdom of the Netherlands desired a new name for this province. It was decided that the historic connection to the town and duchy of Limburg was to be restored, albeit only in name. It is important to note that the history given below is that of the region, the current province Limburg of the Netherlands. There existed no polity or other entity going by that name covering this territory until 1815. For centuries, the strategic location of the current province made it a much-coveted region among Europe's major powers. Romans, Habsburg Spaniards, Prussians, Habsburg Austrians and French have all ruled parts of Limburg. For long periods of history the region was not united under the same rule. The first inhabitants of whom traces have been found were Neanderthals who camped in South Limburg. In Neolithic times flint was mined in underground mines, including one at Rijckholt that is open to visitors. Just after the Roman conquest the Eburones, the inhabitants of most of the area of current Limburg, were annihilated by the legions of Julius Caesar with help of neighbour tribes, this as a punishment for a partially successful ambush set by their leader Ambiorix. After this genocide the area was repopulated with a diverse set of peoples that later under Roman rules, amalgated in the Tungri (note Tongeren, in Roman times the capital of the area). Especially the southern part of current Limburg, along the Via Belgica was thoroughly Romanized and a few still existing towns and cities were founded in this period, including Mosa Trajectum (Maastricht) and Coriovallum (Heerlen). Bishop Servatius introduced Christianity in Roman Maastricht, where he died in 384. As Roman authority in the area weakened, Franks took over from the Romans, and the area, now called Austrasia, flourished under their rule. Especially the middle and southern part of the current province formed an important part of the heartland of Austrasia. In 714 Susteren Abbey was founded, as far as is known the first proprietary abbey in the current Netherlands. Main benefactor was Plectrude, the consort of Pepin of Herstal. Charles Martel was born in nearby Herstal and Charlemagne also had close links with the area. He made Aachen the capital of the Frankish empire. 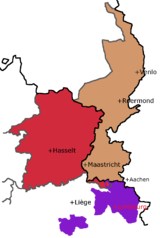 In 870 the treaty of Meerssen, the third partition treaty of the Frankish empire, was signed in Meerssen, just north of Maastricht. 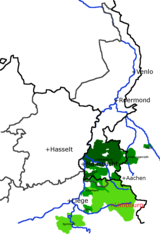 The river Meuse became the border between the Western- and Eastern Frankish kingdoms, placing the largest part of the current Dutch province of Limburg in the far west of the Eastern Frankish kingdom. Around and immediately after this treaty Frankish power in the area of the current Netherlands more or less collapsed. For two or more years a large Viking army, operating from a place on or near the Meuse called Ascloa (or Hasloa or Haslon), wrought havoc in the neighbourhood. The damage was such that the emperor, Charles the Fat was forced to ensemble a large multinational army, that in 882 unsuccessfully besieged this island. In the end of the 10th century, the area that is now Limburg, just like the largest part of the current Netherlands, belonged to the newly formed Holy Roman Empire. In the first decades of this empire the founding imperial family has close ties to areas in current northern Limburg. The emperor Otto III for instance was born in 980 in Kessel, practically on the current border between Limburg and North Rhine-Westphalia, just east from Gennep. In 1080 in Genneperhuis, just north of Gennep, Norbert of Gennep was born as a son of the count of Gennep. He was the founder of the order of the Premonstratensians. By the late Middle Ages, present day province Limburg's territory was mainly part of the Duchy of Brabant, Duchy of Gelderland, Duchy of Jülich, the Principality of Liège and the prince-bishop of Cologne. These dukes and bishops were nominal subordinates of the Emperor of the Holy Roman Empire, but in practice acted as independent sovereigns who were often at war with each other. These conflicts were often fought in and over Limburg, contributing to its fragmentation. An important battle was the Battle of Worringen in 1288, were a coalition led by the duke of Brabant overcame a coalition led by the archbishop of Cologne and the House of Luxemburg over the inheritance of the Duchy of Limburg. Map showing the medieval "lands of Overmaas" and the Duchy of Limburg, both in the Middle Ages possessed by the Dukes of Brabant. Together these two counties formed one province in the Seventeen Provinces. (The dark lines are the modern borders). Limburg was the scene of many bloody battles during the Eighty Years' War (1568–1648), in which the Dutch Republic threw off Habsburg Spanish rule. At the Battle of Mookerheyde (14 April 1574), two brothers of Prince William of Orange-Nassau and thousands of "Dutch" mercenaries lost their lives. Most Limburgians fought on the Spanish side, being Catholics and being opposed to the Calvinist Hollanders. In the early modern era, Limburg was largely divided between Spain (and its successor, Austria), Prussia, the Republic of the Seven United Netherlands, the Principality of Liège and many independent small fiefs. In 1673, Louis XIV personally commanded the siege of Maastricht by French troops. During the siege, one of his brigadiers, Charles de Batz-Castelmore d'Artagnan, perished. He subsequently became known as a major character in The Three Musketeers by Alexandre Dumas, père (1802–1870). The modern boundaries of Dutch Limburg, along with its neighbour, Belgian Limburg, were basically set during the period after the French revolution, which erased much of the "ancien regime" of Europe, with all its old boundaries and titles. These two provinces were part of a new French département, named (like many départments) after the river running through it, "Meuse-Inférieure", meaning simply "lower Maas". Following the Napoleonic Era, the great powers (the United Kingdom, Prussia, the Austrian Empire, the Russian Empire and France) united the region with the new Kingdom of the Netherlands in 1815. A new province was formed which was to receive the name "Maastricht" after its capital. The first king, William I, who did not want the medieval of Limburg to be lost, insisted that the name be changed to "Province of Limburg". As such, the name of the new province derived from the old Duchy of Limburg that had existed until 1648 on the southern borders of the new province. Map showing the two contemporary provinces called "Limburg" as well as the medieval Duchy they are both named after. (The small overlap is Teuven and Remersdaal, two villages in the eastern part of Voeren, a municipality in Belgian Limburg since 1977). When the Catholic and French-speaking Belgians split away from the mainly Calvinist northern Netherlands in the Belgian Revolution of 1830, the Province of Limburg was at first almost entirely under Belgian rule. However, by the 1839 Treaty of London, the province was divided in two, with the eastern part going to the Netherlands and the western part to Belgium, a division that remains today. With the Treaty of London, what is now the Belgian Province of Luxembourg was handed over to Belgium and removed from the German Confederation. To appease Prussia, which had also lost access to the Meuse after the Congress of Vienna, the Dutch province of Limburg (but not the cities of Maastricht and Venlo because without them Limburg's population equalled that of the Province of Luxembourg, 150,000 ), was joined to the German Confederation between September 5, 1839 and August 23, 1866 as Duchy of Limburg. On 11 May 1867, the Duchy, which from 1839 on had been de jure a separate polity in personal union with the Kingdom of the Netherlands, was reincorporated into the latter with the Treaty of London, though the term "Duchy of Limburg" remained in some official use until February 1907. Another idiosyncrasy survives today: the head of the province, referred to as the "King's Commissioner" in other provinces, is addressed as "Governor" in Limburg. The Second World War cost the lives of many civilians in Limburg, and a large number of towns and villages were destroyed by bombings and artillery battles. Various cemeteries, too, bear witness to this dark chapter in Limburg's history. Almost 8,500 American soldiers, who perished during the liberation of the Netherlands, lie buried at the Netherlands American Cemetery and Memorial in Margraten. Other big war cemeteries are to be found at Overloon (British soldiers) and the Ysselsteyn German war cemetery was constructed in the Municipality of Venray for the 31,000 German soldiers who lost their lives. According to the research of Herman van Rens, the residents of Limburg were especially active in hiding local and refugee Jews during the Holocaust, to the extent that the Jewish population even increased during the war. Jews in hiding were three times as likely to survive in Limburg as in Amsterdam. In December 1991, the European Community (now European Union) held a summit in Maastricht. At that summit, the "Treaty on European Union" or so-called Maastricht treaty was signed by the European Community member states. With that treaty, the European Union came into existence. Limburg mijn Vaderland (Limburg my Fatherland) is the official anthem of both Belgian and Dutch Limburg. Although standard Dutch is the official language, and the language most-used, Limburg has its own dialect, called Limburgish (Dutch: Limburgs). It has been an official regional language since 1997 and it receives moderate protection under Chapter 2 of the European Charter for Regional or Minority Languages. The Dutch, German, and Belgian governments do not recognise it as an official language. Limburgish is spoken by an estimated 1.6 million people in Dutch Limburg, Belgian Limburg, and Germany. There are many different dialects of Limburgish; almost every town and village has its own. A lot of isoglosses cross through Limburg. There is not one dialect that fully represents Limburgish. Dialects in the north, nearby Venray and Gennep, are classified as South Guelderish and are closely connected to the dialects in the northeast of Brabant (Land van Cuijk) and the region of Nijmegen. Dialects in the southeast (near Aachen) are closer to Ripuarian and are sometimes classified as Southeast Limburgish. Dialects in the western part of Limburg, surrounding Weert, are influenced by the neighbouring dialects of southeast Brabant, which means that the tone is more Brabantic than in the rest of Limburg. Provincial Government Buildings in Maastricht. The provincial council (States-Provincial - Provinciale Staten) has 47 seats, and is headed by a King's Commissioner (Commissaris van de Koning) who unofficially is called the Governor. While the provincial council is elected by the inhabitants, the King's Commissioner is appointed by the King and the cabinet of the Netherlands. Since 2011 Theo Bovens (CDA) holds the office of 'Governor'. Since the 2011 elections the Christian Democratic Appeal (CDA) was the largest party in the council, although the Party for Freedom (PVV) won the most votes during the election. However, two members of the PVV left the party, taking their seats with them, which lost the PVV their number one status. Since the 2015 elections the CDA (11 seats) has again been the largest party, followed by the PVV (9 seats) and the Socialist Party (SP) (8 seats). The province's daily affairs are taken care of by the Provincial-Executive (Gedeputeerde Staten), which are also headed by the King's Commissioner; its members (gedeputeerden) can be compared with ministers. The Provincial-Executive 2015-2019 consists of the following parties: CDA, SP, VVD, D66 and PvdA. Limburg is a salient of the Netherlands into Belgium. Compared to the rest of the Netherlands the southern part of Limburg is less flat, slightly undulated. The highest point in the continental Netherlands is the Vaalserberg (meaning 'mountain' of Vaals) with a height of 322.4 metres (1,058 ft) above NAP, rising approximately 110 metres above the village Vaals, where three countries (Netherlands, Belgium and Germany) border each other at the so-called "Three-country-point". Limburg's main river is the Meuse, which passes through the province's entire length from south to north. Limburg's surface is largely formed by deposits from the Meuse, consisting of river clay, fertile loessial soil and large deposits of pebblestone, currently being quarried for the construction industry. In the north of the province, further away from the riverbed, the soil primarily consists of sand and peat. Limburg makes up one region of the International Organization for Standardization world region code system, having the code ISO 3166-2:NL-LI. The province of Limburg has 33 municipalities. From North to South: Gennep, Venray, Weert, Venlo, Roermond, Sittard, Geleen, Heerlen, Valkenburg, Kerkrade, Vaals, Maastricht. In the past peat and coal were mined in Limburg. In 1965–75 the coal mines were finally closed. As a result, 60,000 people lost their jobs in the two coal mining areas, Heerlen-Kerkrade-Brunssum and Sittard-Geleen. A difficult period of economic readjustment started. 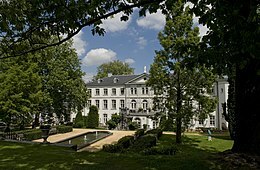 The Dutch government partly eased the pain by moving several government offices (including Stichting Pensioenfonds ABP and CBS Statistics Netherlands) to Heerlen. The state-owned corporation that once mined in Limburg, DSM, is now a major chemical company, still operating in Limburg. In 2002 DSM sold its petrochemical division (naphtha crackers and polyolefin plants) to SABIC of Saudi Arabia. In 2010, the agro and melamine business groups were sold to OCI Nitrogen. SABIC is located on the Chemelot campus in Sittard-Geleen, which is bounded by the Chemelot Industrial Park, one of Western Europe's biggest industrial sites. At this moment 8000 people work at Chemelot, of which 1000 are active at the Campus. The innovation and licensing division Stamicarbon of DSM was sold in 2009 to Maire Tecnimont, the parent company of an engineering, main contracting and licensing group that operates worldwide in the oil, gas & petrochemicals, power, infrastructure and civil engineering sectors. Stamicarbon is based in Sittard-Geleen. VDL Nedcar in Born (Sittard-Geleen) is the only large-scale car manufacturer in the Netherlands, currently manufacturing MINI's and BMW X1's. Other industries include Rockwool in Roermond, Océ copiers and printers manufacturers in Venlo and a paper factory in Maastricht. There are four large beer breweries in Limburg. 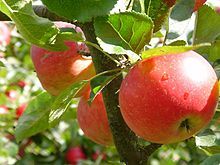 Southern Limburg has long been one of the country's two main fruit growing areas, but over the last four decades, many fruit growing areas have been replaced by water as a result of gravel quarrying near the Meuse. Tourism is an essential sector of the economy, especially in the hilly southern part of the province. 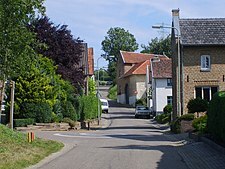 The town of Valkenburg is the main centre. In 2005, the two provincial newspapers, De Limburger and Limburgs Dagblad, merged. Square in front of the Munsterchurch at Roermond, where the provincial diocese of the Roman Catholic church seats. Choral singing is popular in Limburg. One of its best-known choruses is the Mastreechter Staar (Maastricht Star), which performs nationally and internationally. Also held in Kerkrade (situated on the German border) is the Schlagerfestival, a nationally broadcast event presenting singers of German-language pop music called Schlagers. Since 1969 yearly on the Pentecost weekend an international pop music festival called Pinkpop Festival takes place in the southern part of Limburg; initially at Geleen, since 1988 at Schaesberg. More nationally or internationally known musicians from this province are mentioned hereunder in section "Famous Limburgians". The Limburg Symphony Orchestra, that resided and rehearsed in Maastricht, and was the oldest symphony orchestra of the Netherlands (founded in 1883) following elimination of government grants merged with Het Brabants Orkest to form a single ensemble with the new name of the philharmonie zuidnederland, as of April 2013. Many places in both Netherlands' and Belgian Limburg still have their own (by now folkloristic) schutterij. 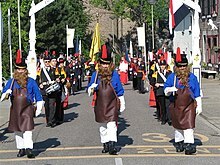 Yearly there's a festival, in which all 160 of them compete for the highest honours to be gained, in the "OLS" (Oud Limburgs Schuttersfeest), which is held in either a place in Belgian or Netherlands' Limburg. In Limburg there are currently four professional Football clubs; Roda JC Kerkrade, VVV-Venlo, MVV Maastricht and Fortuna Sittard. Fortuna Sittard and VVV-Venlo compete in the highest Dutch division, the Eredivisie. The others compete in the second highest division. 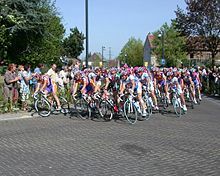 The annual bike classic Amstel Gold Race is run in the southern part of Limburg. The area has also staged the UCI Road World Championships six times, once hosted by Heerlen and five times by Valkenburg. Team handball is the third most popular sport in Limburg. The women's team, HV Swift Roermond, has won the national championship in the highest division 19 times. The male teams, Sittardia (Sittard), Vlug en Lenig (Geleen) and BFC (Beek), which in 2008 merged as the Limburg Lions, have in total won the national championship 25 times. Roman Catholic (67.8%), no affiliation (22.5%), Islam (4.4%), Protestant Church in the Netherlands (2.4%), Other Christian denominations (2.6%), Hinduism (0.2%), Buddhism (0.2%), Judaism (0.1%) . In 2012, from April 5 to October 7 the ten yearly world horticulture expo "Floriade" was held in Venlo. Nationally and internationally known are nature films and nature television series produced by filmdirector Maurice Nijsten and nature protector Jo Erkens. ^ Limburg is the only province in the Netherlands that informally calls the King's Commissioner a Governor. ^ "Limburger (n.)". The Online Etymology Dictionary. ^ Cnaan Lipshiz (May 19, 2014). "For Some Dutch Jews, Limburg Province Was Refuge in Storm of Holocaust". The Forward. ^ "Gefuseerd orkest verder als philharmonie zuidnederland". Trouw. 2013-04-04. Retrieved 2013-04-09. ^ "De religieuze kaart van Nederland, 2010–2013" (PDF). Centraal Bureau voor de Statistiek. Wikimedia Commons has media related to Limburg (Netherlands). 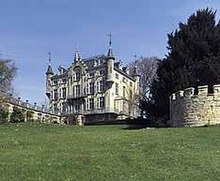 Wikivoyage has a travel guide for Limburg (Netherlands).